Parker and I watched The Sound of Music recently (one of my favorite childhood movies! ), and that became the inspiration behind this post. A few of my favorite things. I started looking around the house and noticing the things I hope we have forever, the things that are special to us, and those things that never should have become a part of our lives to begin with (hello random kitchen appliances I will never use). I blogged about our house a couple of weeks ago, but I didn't mention some of the special things in it. 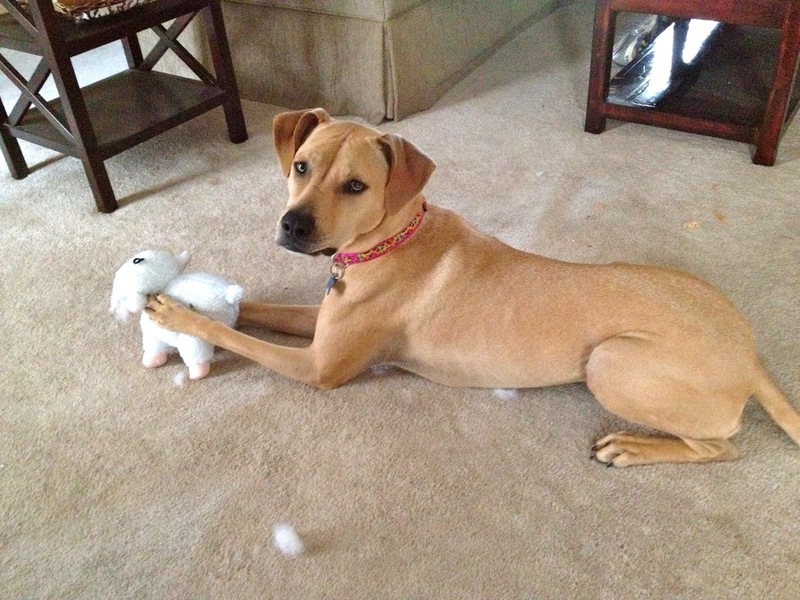 So here are a few of my favorite things! Parker bought this for me in college, and it was the first piece of artwork we ever owned. We used to see this painting all the time in the local movie theater and always thought it was so neat. 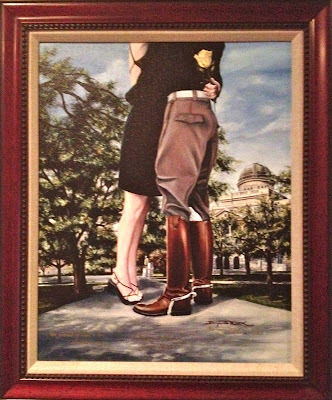 Our proposal was modeled after this painting, so I know it will always be special to us. Benjamin Knox was actually there the day we picked it up, so he signed the painting, wrote our names and wedding date, and wrote 1 Corinthians 13:13 at the bottom. Score! If you have known Parker and I for .5 seconds, you know that we are Aggies and in love with Texas A&M. Parker gave me this painting for our first married Christmas together, and I was ecstatic! Ring day is a big deal in Aggieland, and I love that it has our class year on each ring. 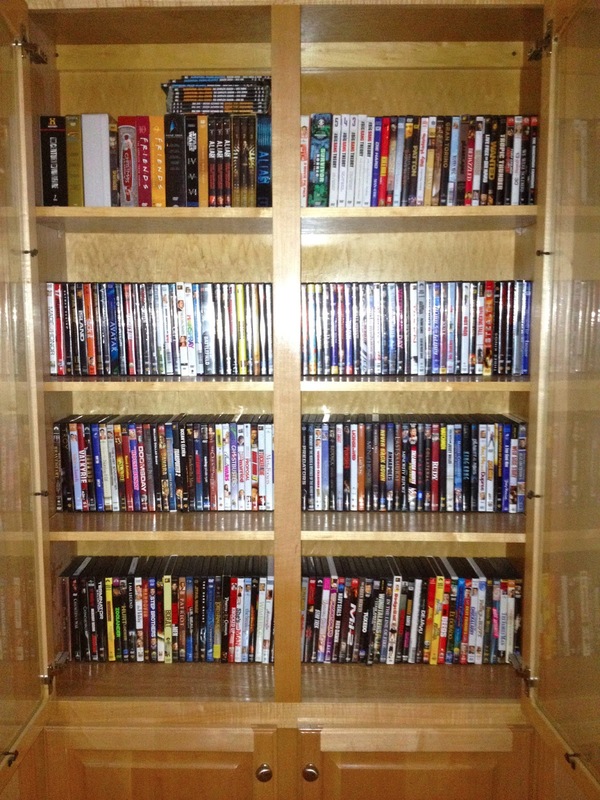 So Parker and I had a mild obsession with buying DVDs in college. Our thing has always been going to the movies or watching movies at home, so we would go to Hastings or other discount stores and buy DVDs that were on sale. We got so excited when we came home with 5 DVDs and only spent $20. I can shamefully say there are some DVDs in there we still have not watched. 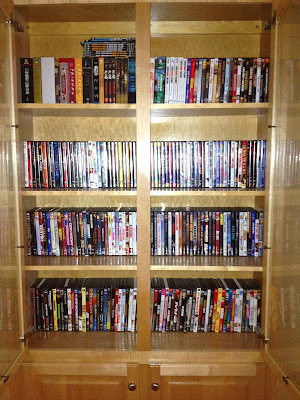 Thankfully we came out of this phase before we were broke living on the streets with 200 DVDs. I love our little collection though and it brings back fond memories from college...we were those cool kids who went to Hastings instead of the bar. I'm not mad at it. I designed and ordered our wedding book shortly after we got married, and I love it! No I don't look at it every day, but it's fun to thumb through every once in a while to relive the day we said I do! 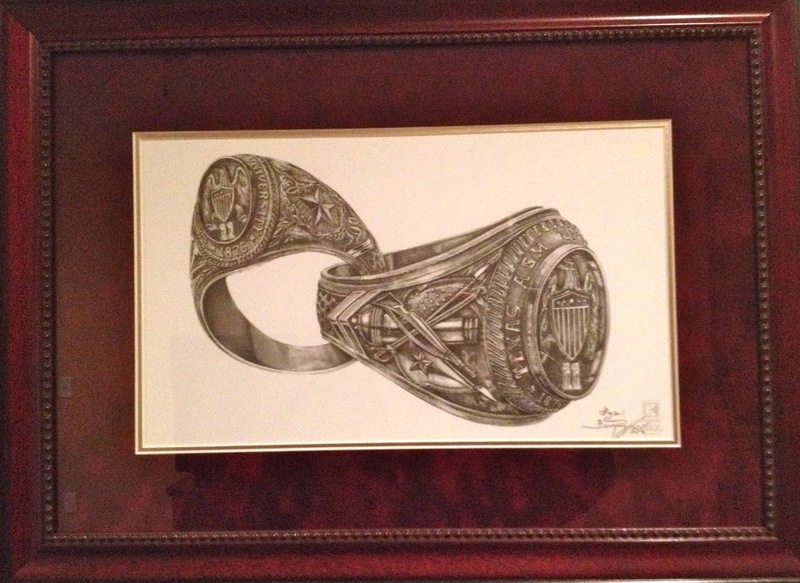 One of Parker's friends from college is an amazing pencil sketch artist, so Parker surprised me with this commissioned piece of our proposal. The bottom text says "And I thought I loved you then", which is an excerpt from Then by Brad Paisley. That was our first dance song at our wedding and has always had special meaning to us. 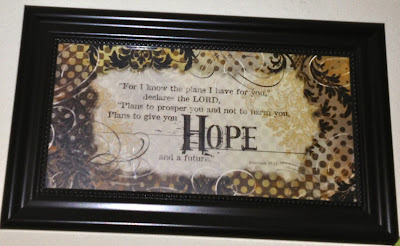 My favorite verse is Jeremiah 29:11 and has been for a long time. It just speaks to me, and I feel like it's gotten me through a lot of good and difficult times. My mom had a stained glass picture hanging in our kitchen growing up, so I literally read this verse multiple times a day. For our first Christmas, my mom gave me this framed picture of the verse, and I knew right where I wanted to hang it. It hangs above the window in our kitchen, and I can't wait for future Phelplets to see and read it every day. 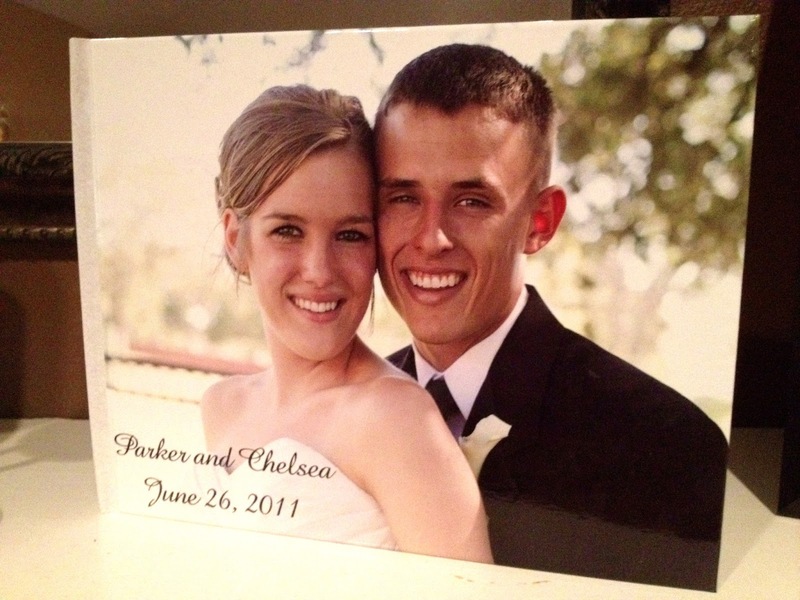 So being that I am a total cheeseball and a sucker for all things sappy, I had to purchase this sign from Hobby Lobby after Parker and I got engaged. It hangs in our entry way, and I love it! Growing up, I lived right next to a lot of my family. Some of my fondest memories are baking with Nana. Let me tell you, this women can cook! She is a rock star, and I try to spoil Parker as much as she spoils my Grandad with delicious desserts and treats. 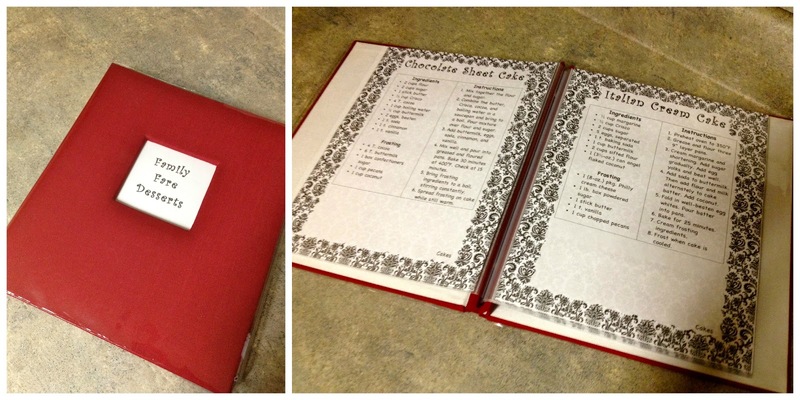 For Christmas this past year, my sister Natalie put together a cookbook full of all of our family recipes. I'm obsessed! It's one of the coolest gifts I have ever received. Of course little Jenny had to be on the list of my favorite things. You can read about my obsession with her here. and here. and here. and here. and here. Okay I'll stop. Best friend. Soul mate. This handsome cutie is my favorite thing! We have the same anniversary! Just a year apart! How fun! Stopping by from the Favorite Things link up and loving your paintings! How special. 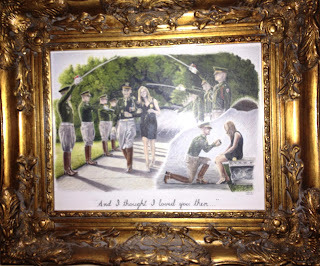 The paintings based on your proposal are awesome.